which our family loves the most of all fish choices. so it would not taste too "fishy". 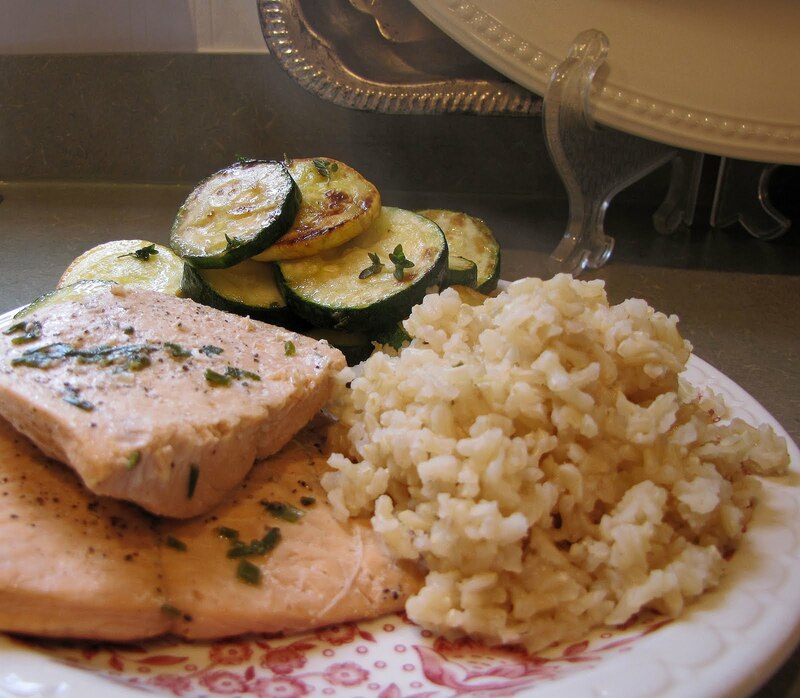 Salmon, to us, is a wonderfully not-as-fishy-tasting choice. The French use sole, or flounder, but that's not what I had in my freezer. 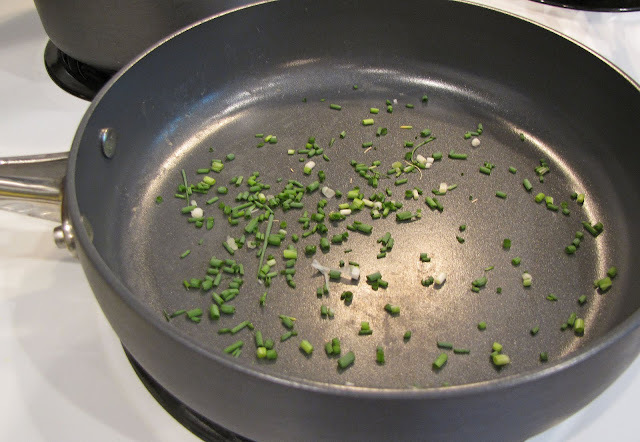 Sprinkle half the onions in the bottom of a skillet. 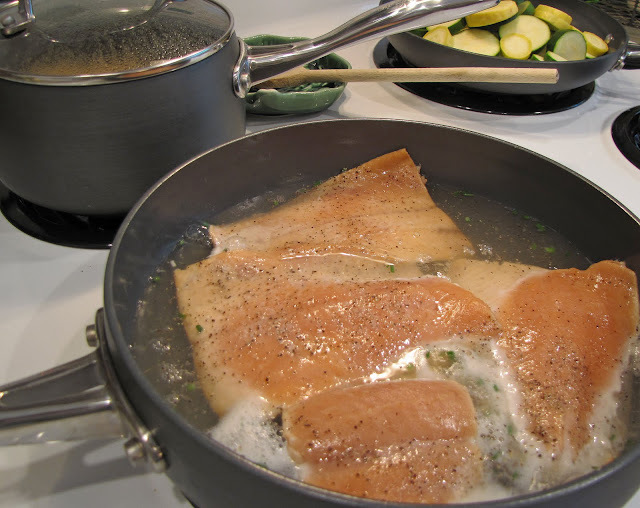 Season fillets lightly with salt and pepper and lay them over the onions. 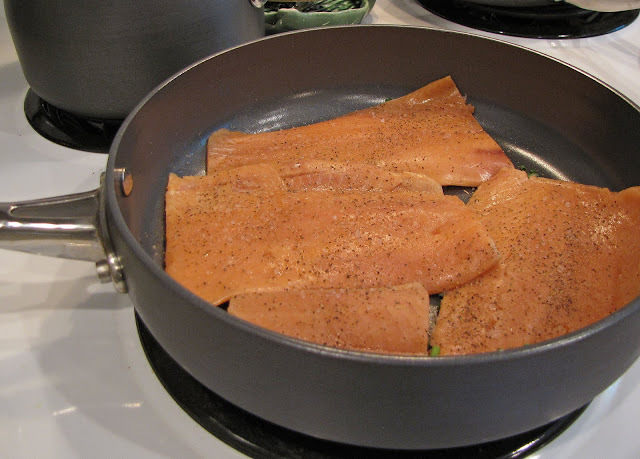 Sprinkle fillets with remaining onions and drizzle olive oil over the fillets. 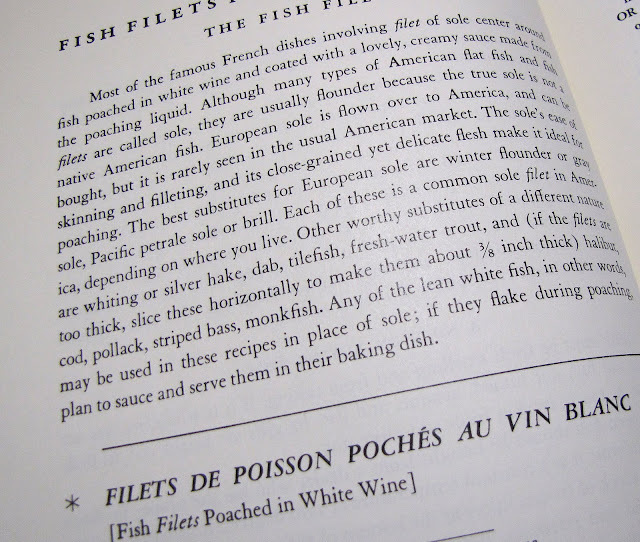 Pour in the wine or vermouth, and add water so fish is barely covered. 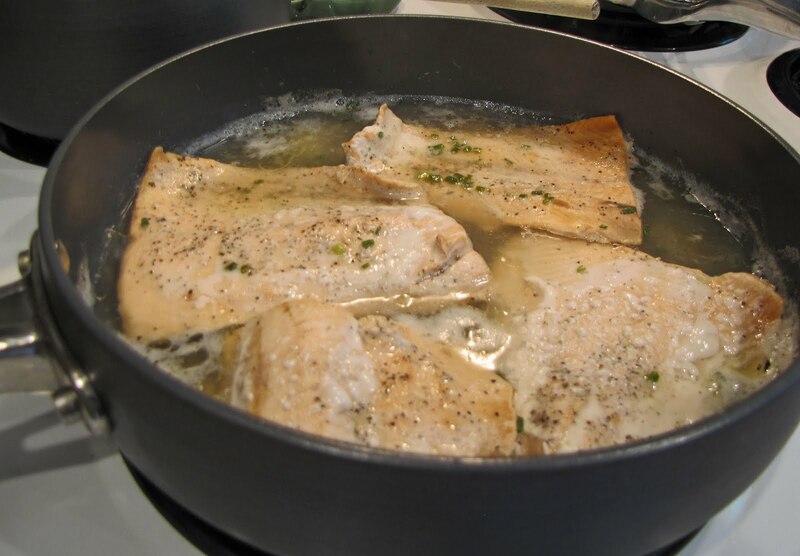 Bring to a simmer for 8-12 minutes depending on the thickness of the fillets. The fish is done when a fork pierces the flesh easily. Place a cover over the pan, and drain off the liquid. We had "squish" (as my girls call it) and zucchini from the garden, too. I sauteed them with English Thyme from my herb garden. Added brown rice, and called it a meal. like those sauces that accompany expensive fare. The fillets were flaky, yet slightly dry. but that involved butter and we were trying to make the dish lighter. As far as having a "fishy" flavor, it DID NOT. This was THE EASIEST recipe to make. only with a white sauce. I enjoy your cooking reviews! We need to eat more fish so maybe I will give this recipe a try. I was not impressed with this recipe either. It was okay. I'm glad you reviewed it because I thought it was my cooking! I do have a wonderful and healthy salmon recipe I will email you. If interested, let me know. i so wish i could get the hubs to eat fish. he just refuses unless it is deep fried. ugh. this looks so light and tasty! Well it looks really good! I love "squish"!! 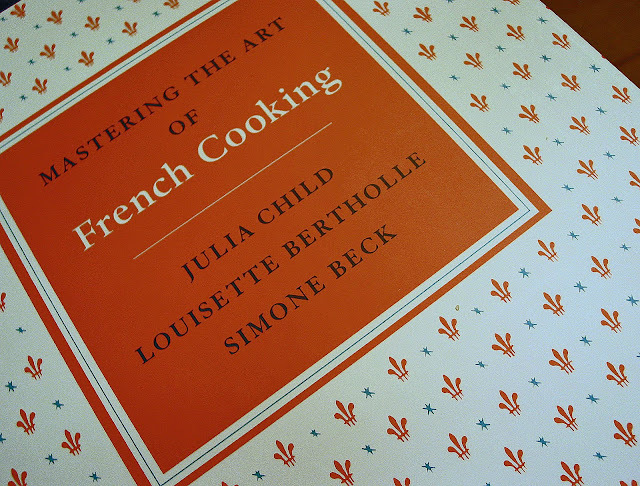 I love your great French cooking adventure! I am always looking for healthy prep ideas and dishes because of restricted diet(s). Even the skinny husband is now on low cholesterol fare. It's not easy for him either. This looks like one that even I could do. Low fat, high style! You asked about our location. We're in Statesboro, which is about an hour from Savannah. I love Greenville. My older daughter came this // close to going to Furman University. It is a stunning campus and such a beautiful general area.